To avoid having to draw the form needed by this exercise, right-click on the name of your project in Solution Explorer then choose Add --> Existing Item... (you can also press CTRL + D to do the same thing). Choose only the file called frmCalculator.cs in the above folder to import it into your project, then make this the default form. 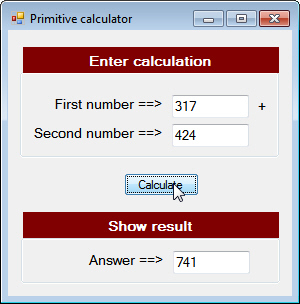 When you run your application, you should now see a simple calculator form. 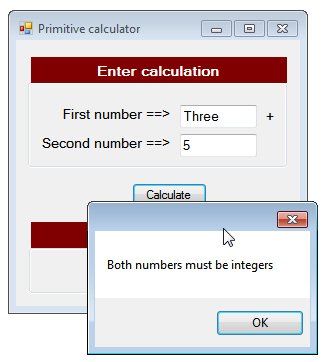 Your error-trapping should exit the subroutine if a user has entered anything but whole numbers into either of the two input boxes. What you should see if you enter genuine numbers in the two boxes; the correct answer at the bottom of the form. Close down any forms that you have left open.